Every New York fashionista needs accessories with style. The NYC Color Primer comes in a sleek, handy tube pack that will fit in perfectly in any make-up bag. The formula inside is just as handy as it glides on evenly and easily on the skin. 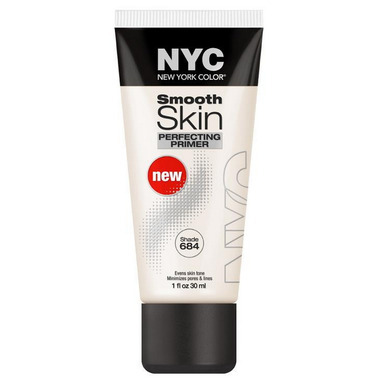 NYC Color’s Primer instantly transforms even the most city-weary complexions, reviving dull looking skin and boosting radiance. Think of this so-called lingerie for your skin as unmentionables definitely worth mentioning! It’s the ultimate accessory for your skin that’s perfect for all skin types. Not too bad of a primer! You really don't need a lot of product it distributes evenly but there is light sparkle blended in. Personally I don't mind because my foundation goes on top anyway but if you don't shimmery products don't purchase! This gives your skin a luminescent glow, and looks very nice under make-up or alone. I like that it does not have heavy fragrance. Good primer, great value! Not a very good product, leaves your skin looking shiny and feeling oily. For a few dollars more get the Rimmel primer. The texture and smell of this product also not very good. Would not purchase again. Great price for a primer. love the dewy glow you get without adding makeup. Its also very moisturizing. It is very light which is great and it is great to wear on it's own or under your makeup. Doesn't last long, its not an all day wear but it is a very good product. Works great under makeup plus it makes you glow.I love this.The glow is not as in a shiny glow but a Fresh glow.I highly recommend this.Also i sometimes mix it with my foundation and it looks great.For the price you cannot go wrong Love it! !